If you've been a regular reader of my blog you may know that I've now been a single parent since the beginning of the year and have gone from living comfortably on two wages down to just one. I had no savings and had to learn to budget and not live above my means. Luckily, I didn't have to worry about moving and took out a loan to buy a new car as we were previously car sharing. Failure was not an option for me and I was going to do everything possible to become financially stable to keep a roof over our heads and pay the bills each month and still have money left over for a few luxuries each month. At the time I was on maternity leave but also working self employed for myself so luckily I was able to bring in just about enough money each month to pay the rent and bills however I had no savings and nothing left at the end of each month. Prior to this I was never much of a frugal person and never looked for a good deal when buying gifts or toys online. Now I've realised I can save a lot of money by searching for deals on sites such as Hot UK Deals, Groupon, Money Saving Expert, and even searching for the deals of the day on eBay or Amazon before purchasing. Don't just blow your hard earned cash when you can get money off even if it is just a few pounds it all adds up! Speaking of online shopping when I purchase anything online I now do it through Quidco (Ebates if in the US) as this give me money back on pretty much everything I buy. Sites such as Quidco and Top Cash Back are great cash back sites which you can leave running in the background and not check for months and realise you've accumulated £100s of pounds! Have a birthday coming up or Christmas presents to buy use these sites to get money back on your purchases! I looked into reducing my bills by using comparison sites such as Uswitch and Money Super Market and managed to get my electricity and gas bill down by £10 a month as well as £10 off my Sky broadband and phone bill each month. I also looked at changing car insurance and although I can't renew my policy until next year, when I do I will be saving a minimum of £40 a month! Another great way of saving money is to reduce you food shop each week. I switched from top brands to supermarket own and also did my shopping online which helped to cut my weekly food shop in half as it meant I wasn't just throwing everything and anything into the trolley. I'd also recommend meal planning as this will help you keep you in the right mind frame and stick to only buying the ingredients you need for each meal. I had a massive clear out at the beginning of the year and sold many second hand items on local Facebook groups such as baby toys and pushchairs. I also sold some items on eBay which were brand new and managed to make over £500. I'm hoping to do this again soon and the money will go towards our holiday fund for next year. Back in April I started a money saving challenge and bought one of those pots you can only open with a tin opener. I have since opened it as I needed the money so get my car fixed but I did manage to save £500 in around 6 months just buy putting in a couple of quid a week or a £5 note when I had one in my purse. The 52 week money saving challenge is also a great way of saving money throughout the year and can be used for a holiday, Christmas or what ever you may be saving for. 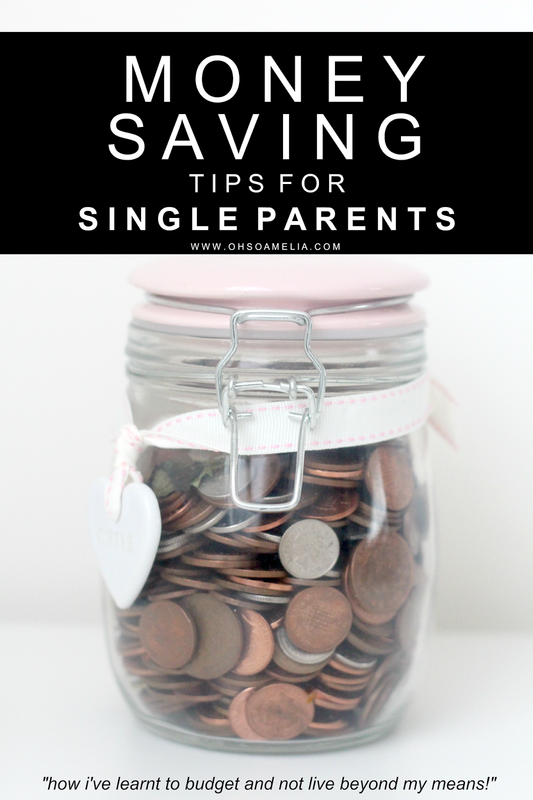 Do you have any money saving tips for single parents or living off one income? After reading this post I can only say that you ' are amazing . Apart from the very useful , concrete and well organized content of this post , it is noticeable you are making everything possible to "keep a roof above your head " (You May ask why I used quotation marks , well I am not an Inglés native speaker and I love idioms ! haha ) , and there 's nothing more motivational , inspiring and dignified than that. Also I am a single mom and I give English lessons at home , that's one of my income sources . I understand how hard it can be sometimes, not only because of the actual lack of money or resources , but Because of the insecurity. Sure way to save = you can save money everyday forever on toilet paper with a Hand Bidet Sprayer. One of the easiest and best things you can do. It requires no new plumbing to install and you will enjoy superior, healthier hygiene and you will never run out! See www.bathroomsprayers.com.